We love Colortime, in our house. My son was so thrilled when he got a treat bag, that he gets to color. He's been working on it for about 3 weeks, now. And, he's still not satisfied, at age 6. The fabric markers put the final touch on the treat bag. (Also purchased from Colortime). He loves his treat bag, and can't wait to use it on Halloween. This Halloween design is just like a regular Colortime item, but in addition, the ink magically glows in the dark! 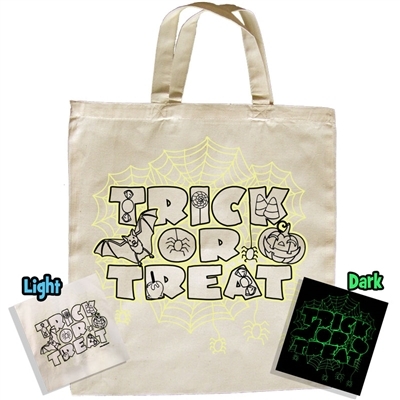 This tote bag's design is made with ink that glows in the dark, but if you want to further enhance this special feature color this 15" X 16" (Full size) Halloween craft project with Colortime's permanent fabric markers! There are all kinds of fun things, that you can purchase from Colortime. Including: Pillow cases, tote bags, back packs, and t-shirts. You will love Colortime, as well as, your kids. There's even free shipping on orders over $60. You can't beat this, if you want something memorable for your child's class, or for your child. Both of the bags, pictured above, are Glow In The Dark. So they are perfect for Trick Or Treating. They will make it memorable for any child. Make sure to check out the Birthday Club, while you are visiting Colortime's Site. Make sure you place your order soon, so that you can get your package before Trick or Treat.